Rocky Aviation joined thousands of NBAA Members this week to stand with Las Vegas. 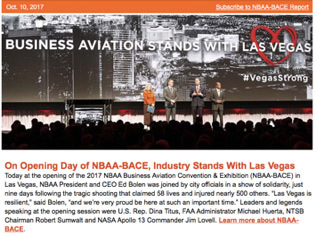 The NBAA annual national event at the Las Vegas Convention Center was reported to be the 1st major event to take place since the tragedy 10/1/17. It was quite inspirational to see this high level of solidarity between the NBAA, National, County and Las Vegas city officials. Our professional organization has done a masterful job of amassing some of the most credible aviation professionals on the planet to say NO to passing a HR bill that would seek to privatize ATC. What do Apollo 13 Commander Jim Lovell, country music superstar Dierks Bentley and Capt. “Sully” Sullenberger from the Miracle on the Hudson have in common? They all agree that legislation to privatize our nation's airspace will undermine the safest and most efficient air traffic control system in the world. After I listed my experimental aircraft on Barnstormer’s, I was quickly over-run by tire kickers and curiosity seekers. After a few days, I was so frustrated that I cancelled the listing. I was fortunate to find Rocky Aviation, who worked diligently to sell the plane for me. They quickly found a buyer for the plane and handled all of the details such as the contract, escrow, final transactions and delivery. I was so pleased with the ease of the transaction that I asked them to find the “right” Cessna 182 for me. Again – they worked almost non-stop and creatively to find the plane that I was looking for. I highly recommend the services provided by Dustin, Stephanie, and Rion. They are good, honest people who do what they say will do." Over the last 10 years, I have depended on Rocky Aviation’s founder – Dustin - for the acquisition or sale of aircraft on at least 8 transactions. He is always the critical difference in finding reliable aircraft. I have found his aviation knowledge to be vast. His integrity and ethics are beyond reproach. In many cases Dustin has also provided transition training and risk advice. I would enthusiastically recommend Dustin to anyone looking to make the best aviation decision." Recently, Rocky Aviation assisted with the sale of my aircraft. It was a pleasurable experience from negotiations to closing. Through their marketing and networking efforts, they helped me net about 10% more than I thought was possible. Additionally, much valuable aviation business advice was gained along the way. It would be my pleasure to recommend Rion and Rocky Aviation to family, friends or associates to assist with a future aircraft transaction.